Flat, ribbon wire plier staples for industrial packaging are available at packagingandfastening.com on-sale. Buy hand-held, pneumatic staplers for corrugated box thickness up to 6 layers (two triple-wall). Hand-held pneumatic plier staplers - 1/2 inch crown ribbon wire staples and medium wire plier staples for industrial packaging are available on-sale. Bostitch pneumatic 1 inch crown triple wall plier staplers are on-sale. Bostitch pneumatic P51-10B plier staplers fastens 3/8" to 5/8" SB103020 1/2 inch crown plier staples and features box seam, tray and lid capability for all types of corrugated containers where speed and maneuverability are a must. Ideal for replacing or enhancing glue systems where added reliability and security are needed. The P51-10B stapler features a powerful shuttle blade provides pre-compression prior and during the stapling operation giving a strong, tight closure without breaking the corrugated surface. The Bostitch P51-10B 6" by 1" high throat allows flexibility of staple placement and limits interference from obstacles such as box flanges. C-Curved blade available for sealing partial overlap cartons. This industrial plier stapler penetrates and securely fastens up to 2x AB flute or 4x C flute boards. Bostitch pneumatic P51-5B plier staplers fastens medium .050 x .019 wire from 3/8" to 5/8" long SB5019 series 1/2 inch crown plier staples. This trigger operated medium wire plier stapler fastens chipboard headers, trays and lids plus all types of chipboard containers where speed and maneuverability are a must. The P51-5B features a powerful shuttle blade provides pre-compression prior and during the stapling operation giving a strong, tight closure without breaking the surface. The Bostitch P51-5B 6" by 1" high throat allows flexibility of staple placement and limits interference from obstacles such as chipboard box flanges. C-Curved blade available for sealing partial overlap cartons. This industrial plier stapler penetrates and securely fastens up to 2x AB flute or 4x C flute boards. Bostitch pneumatic ESD-4502P triple wall plier staplers fasten S2 type 1 inch crown staples. Drive up to 2 inch long heavy duty wire 16 gauge staples. 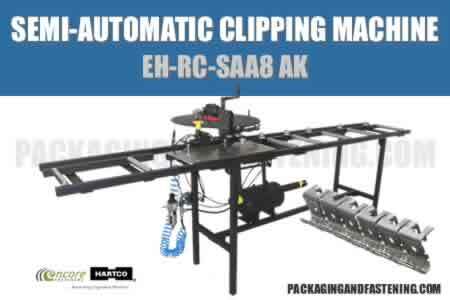 This heavy wire plier stapler fastens triple wall corrugated trays and lids as well as all types of corrugated containers. 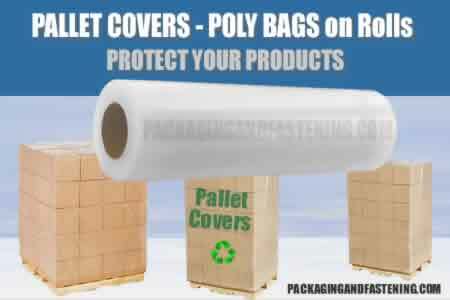 Ideal for fastening up to 6 layers of corrugated products. ESD-4502P pliers compresses corrugated material, drives and clinches heavy duty 16 gauge staple with a single trigger actuation. This unique triple wall plier stapler features an innovative power control valve to allow you to easily adjust power by 30%. Additionally, a walking stick option is available. 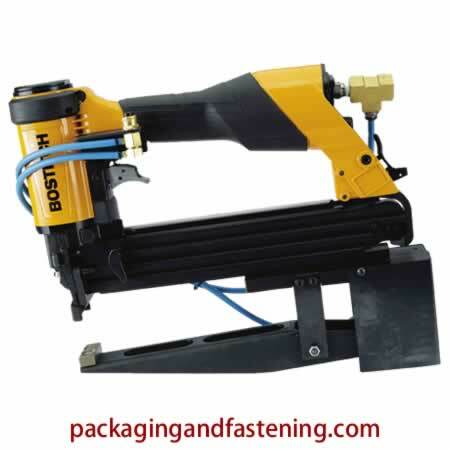 We offer you a wide selection of pneumatic plier staplers for fastening a wide variety of corrugated products. ESD-4502P plier staples fastens triple wall boxes efficiently. 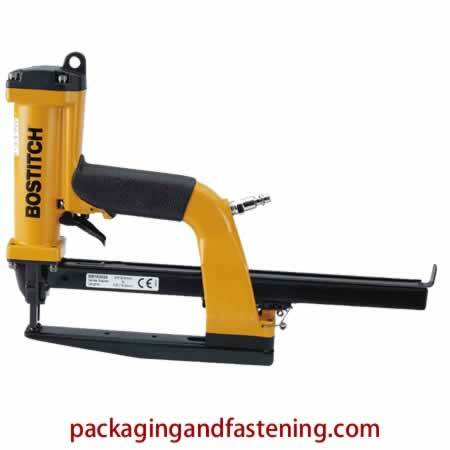 Bostitch pneumatic plier staplers deliver dependable performance in light, medium volume packaging applications. JB600 air plier staplers are here. Buy hand plier staplers for Bostitch stick STCR5019 Series staples. 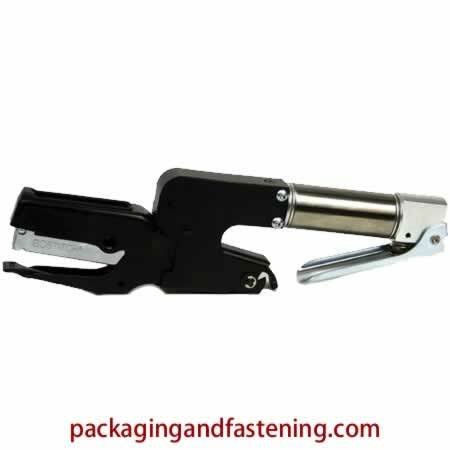 7/16 inch power crown pneumatic trigger operated plier staplers are ideal for low and medium volume packaging and fastening requiring plier stapling capability. Bostitch engineers designed the JB600 - an air-drive version of P6C-8 to allow users the benefit of continuous stapling by users without stress. The JB600 features a convenient, top loading magazine. This tool's lightweight design makes it an efficient and productive stapler for manufacturing and packaging environments. The JB600 uses either STH5019 or STCR5019 1/4 to 3/8 inch length staples available now online. Plier staples for corrugated boxes, trays, lids and mailing tubes. 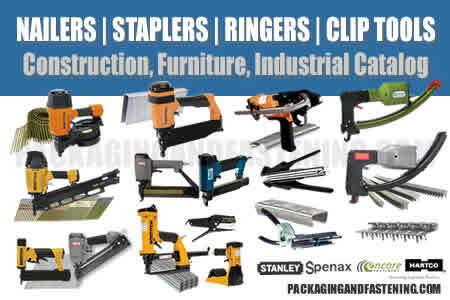 Plier staples for chipboard boxes, trays, lids and headers. Buy 16 gauge plier staples for construction of Triple Wall Corrugated Boxes and other corrugated packing products with a maximum 2 inch staple length. Heavy wire 6 layers plier staples are available now. Read More. Buy staples for the JB600 plier staplers. Get STCR5019 series 1/4 inch and 3/8 inch length staples used to fasten medium plier staples available at packagingandfastening.com online now. Read More.